Claim your FREE copy of 10 Time Management Tips: A how-to guide on efficiently managing your time through effective delegating, calendar management and using productivity tools! In this era of downsizing and the quest for efficiency, businesses of all sizes are asking employees to take on extra tasks to boost productivity. Has your job turned into one of those “stretch jobs”? If so, you may be looking for a better way to get more done in less time, reduce stress and stop burning the midnight oil. While you can’t create more hours in your day, you can learn how to use them wisely. That’s where 10 Time Management Tips can help. It’s your guide to working smarter, not longer, every day. Let 10 Time Management Tips show you how to prioritize your tasks and stop working in a crisis mode all the time. Which time management system works best? When your job is to keep things from falling through the cracks, a good time management system can serve as a tightly woven net. But which time management method works best? The one that works for you. The Wall Street Journal columnist Sue Shellenbarger recently took the most widely used systems for a test drive, trying each one for a week. Among them is the Getting Things Done (davidco.com) technique. “GTD” aims to corral all the projects and tasks floating around in your head into an organizing system that you update weekly. The system (in theory) enables you to quickly identify the next step to keep all your projects moving forward. Benefits: It clumps together your tasks by context, making it easy to, say, tackle phone calls all at once. Shellenbarger says that GTD also forced her to better manage paper flow. Downside: The system requires time to master. Discover the other time management systems that Shellenbarger tried, how they work, and how they can work for you in 10 Time Management Tips: A how-to guide on efficiently managing your time through effective delegating, calendar management and using productivity tools. Make technology your slave, not the other way around. Prioritize. Use the 80/20 rule. Robbins has developed a system that can help you maintain concentration and do more in less time. Divide your life into “focus,” “admin” and “spirit” days. 1. Focus days require a strong emphasis on your core work, including strategy sessions, reviews of research and employee evaluations. 2. Admin days usually have lots of different content but similar, routine kinds of tasks, such as signing papers, returning phone calls and running errands. Most people don’t have specific software just for managing their projects. So they use what they can access on their desktops. One great tool for this purpose is Microsoft Outlook. …all with Outlook! Download this FREE Special Report now for repeated success. ___ 1. Give specific directions about how you want a task completed? ___ 2. Wonder what employees are doing and whether their time could be spent better? ___ 3. Reject an employee’s suggestion because it isn’t how you would perform the task? ___ 4. Get annoyed when a normally capable employee makes a simple error? ___ 5. Worry about whether a key task will be done right or on time? ___ 6. Sneak a peek when your employee isn’t around to check a project’s progress? ___ 7. Delegate work in increments rather than explain the entire project at once? ___ 8. Resent or refuse to answer questions about “why” a task needs to be done? ___ 9. Find employees coming to you with questions they should know the answers to? ___10. Talk most of the time during strategy meetings or brainstorming sessions? Download our FREE Special Report to see how you score! Interruptions are a fact of every manager’s daily life. They come with the turf. The ability to manage them well is a hallmark of your time-management competence. Don’t allow your open-door policy to be abused. Let people know when you really can’t be interrupted. Encourage workers to make decisions for themselves. Put a curb on venting time. Stand up when an unannounced visitor enters. Learn to dismiss irrelevant interruptions. Use silence as a weapon. Learn how to actually put this advice into practice. Get 1-2-3 instructions on managing interruptions effectively in 10 Time Management Tips: A how-to guide on efficiently managing your time through effective delegating, calendar management and using productivity tools. How many hours do you think workers spend on average at the office every week? Would you believe 60 hours? And some employees actually brag about working 100-hour weeks. These people believe that the longer they work, the more impressive they look. But the true superheroes are those who work reasonable hours and manage their workloads like pros; get away from the office to recharge, then come back energized and creative; and don’t make careless mistakes because they’re tired and overworked. The first step to managing your workload is handling self-interruptions. Download our FREE Special Report for the 5 best ways to keep yourself from interrupting yourself. It seems like I talk with clients about the challenge of taming their calendars at least two or three times a week. In the age of interconnected scheduling systems like Outlook and the continuous push to get more done with less in any given day, more and more leaders feel like Sisyphus rolling that big rock up the never-ending hill. What the heck can you do to get your calendar back under control and have time to think, reflect, relax, connect, and have some fun and a life outside of work? I’ve been brainstorming that question with my clients lately. Keep your most important objectives in mind. Use the help that’s available. Negotiate on requests for your time. Delegating is management gospel. Unfortunately, some managers pay lip service to delegating: They do the job themselves because they think they can do it so much better and don’t have the time to explain how to do it to a subordinate. This rationalization puts delegating skills right at the heart of any time management program: If you can’t or won’t delegate, you are managing your time badly. It’s as simple as that—and as difficult. Managers who delegate can double, even triple, their productivity by utilizing other people’s talents—a key definition of the managerial function. Poor delegators, by contrast, are constantly on the run, always late and behind schedule, with barely time to grab lunch. Quiz: Are you ready and willing to delegate? Check your readiness to delegate tasks by taking our delegating quiz, available only in 10 Time Managment Tips: A how-to guide on efficiently managing your time through effective delegating, calendar management and using productivity tools. Attorney Eileen Johnson recalls sitting in a nonprofit’s board meeting where the vice chair was on his BlackBerry, the treasurer was reading The Wall Street Journal and another board member was knitting. These are over-the-top examples of what goes on during unproductive meetings. Between vague agendas and never-ending PowerPoints, meetings have become a waste of time for many in the business world. Never schedule a meeting beyond 90 minutes. Deliver meeting material the day before by email. Require a one-page executive summary for all materials. Let meeting participants agree on deliverables. Post the mission statement in the room. Gather opinions with a round-robin approach. Appoint someone to play devil’s advocate. Do 80% of the work before the meeting. Admit it: You’re too busy for all that time management jazz. You prioritize in your head—who has time to make silly lists? And you’ve tried to block out appointments, but emergencies always throw everything awry. The solution? Try managing projects instead of time. That way, you won’t need to check your watch every few hours or grow frazzled trying to jam too much into your day. Match task with the person. Break a project into its component parts—the specific jobs that you can delegate. Then assign these tasks to the appropriate people with deadlines (day and time) for them to complete each stage. Explain what you want done in writing, and include a numbered list of to-do steps to increase clarity. Distribute a master list of everyone’s role to the whole unit so workers can share information easily. Give snappy introductions. When you’re asked to introduce a guest speaker to a group, distribute the person’s full written bio in advance. That way, you can limit your intro to two or three sentences and direct the audience to the handout for more on the speaker’s background. Cluster related jobs. Maximize every trip from your office by arranging groups of meetings, inspections and errands near your destination. Make “just-in-time” decisions. Smart managers choose the proper moment to gather and review the data they need to draw the right conclusion. If you rush to make a decision—only to revisit the issue repeatedly in the weeks ahead—you waste time. The monthly department meeting is next week, and you’ve already heard from four people who want to appear on the agenda. You expect a few more to chime in. It’s your job to create an agenda that affords adequate time for each item, as well as to make sure the meeting runs smoothly and ends on time. Your best approach? Build an adjustable meeting-agenda template in Excel, recommends Annette Marquis, co-owner of TRIAD Consulting. This simple worksheet automatically manages start and end times, she says. When you add a speaker at the last minute, time allotments for other items adjust automatically. See, step-by-step, how to create your own, customized template. 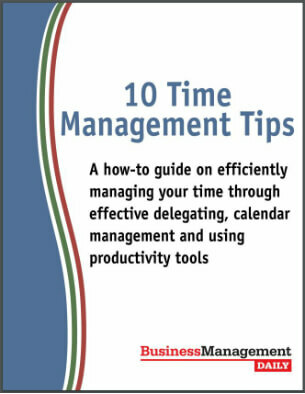 Download 10 Time Management Tips: A how-to guide on efficiently managing your time through effective delegating, calendar management and using productivity tools. More important than getting everything done is getting the right things done. How do you figure out which priorities are most worthy of attention? Learn how to create a structured to-do list that organizes and prioritizes your work from the top down. This organizing map will help you achieve more at work and in life. Find it here in our FREE Special Report. Time Management Tips: Bonus Tip! Create a simple bar chart within a set of data in Excel by pressing F11 in any cell. Switch from one window to the next with Alt-Tab. Use F4 to repeat your last action. It’s definitely a time-saver in Microsoft Word. Say you’re changing the font in certain areas of a document. Once you change the first section, you can highlight the next section and simply use your F4 command to copy the changes. Move to another page quickly with the F5 key, which brings up the Go To box. Take advantage of the shortcut power of macros. Example: You like only one space after the end of a sentence, but many documents come to you with two spaces. Create a macro to take care of that. Control the appearance of text. Examples: Control + [ to decrease font size one point at a time, and Control + ] to increase font size one point at a time. File away emails, once you’ve read them, by pressing Shift + Enter + V to pull up your Folders. Type in the first few letters of a folder name to call it up, then hit Enter. Make up your own shortcuts with ShortKeys Lite. (Other similar software: AutoHotkey and Keyboard Express.) Say you have to enter the same paragraph or contract section in many documents. By assigning a shortcut key to them, you can quickly move from one document to another. Lock your keyboard with Windows Key + L; minimize your screen with Windows Key + M.
Generate white space between paragraphs (12 pt. of spacing) in Word and Outlook by pressing Ctrl + Shift + 0 (zero).